Turn your establishment into the ultimate destination for sports or entertainment with DIRECTV’s exclusive packages and customized music. CMS can design a system for your restaurant or bar that utilizes the latest High Definition (HD) technology and is easy for you and your staff to operate. Have a spa in your hotel or resort? Let us show you how to provide customized music solutions to enhance your customer’s experience. Do you want to make your Event Center, Resort or Hotel a meeting destination spot? We design systems for all meeting rooms. Creative Media Solutions can provide crystal clear television and music programming throughout your health and fitness club. We offer everything from DIRECTV® for Business and Custom Business Music Solutions to Dynamic Digital Signage, Security Surveillance Systems and Voice & Data Low Voltage Cabling. Whether you need one TV or 100 TVs, we will professionally install and configure your television system to help you keep your customers coming in. We offer all the popular makes and models of TVs, so you're sure to find one that fits your Health and Fitness Center as well as your budget. And with DIRECTV programming, your members will be entertained with a variety of sports, news, entertainment and music channels. Let CMS design a distributed audio system that will allow you to create different experiences for your members throughout your club, from your workout rooms to your locker rooms. At CMS we understand that group fitness rooms require more than just music, members need to be able to hear and understand the instructors as well. Using the latest wireless technology, we can design a system that balances the music with the instructor's microphone to create a high-energy atmosphere for your classes. Looking for an effective way to communicate to your members? Dynamic Digital Signage can help you promote services, wellness programs, new classes and programs and keep your members informed of changes in class schedules and club hours. Larger health and fitness centers can also take advantage of wayfinding capabilities to assist members and take some of the burden off of employees. Digital Signage can be interactive or dynamic. It's easy to use, easy to implement, and effective. It can also be used as a money-generating system by sellling ad space to other businesses. Contact us today to find out how Dynamic Digital Signage can help you increase profits. 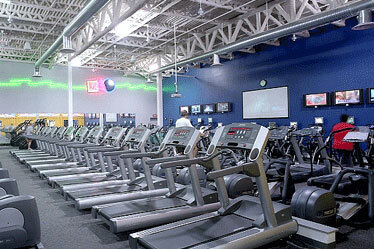 Health and Fitness Clubs require a large investment in equipment, facilities and people. Protect your members, employees and your property with a top of the line video security system designed by CMS. Best of all, with remote technology, you can view your club from anywhere in the world.